When it comes to home party plans, jewelry is always a popular choice. Women love jewelry. So, for a woman passionate about jewelry there could not be a better home business opportunity than a direct sales jewelry company. Jewelry is easy to transport. The variety and wide range of price points make it appealing to most women shoppers. It’s also something that can be worn everywhere giving you a natural opening to discuss your business as people inquire as to what you are wearing. There are many companies out there that are always looking for committed and enthusiastic jewelry lovers that can help them promote their brand and grow the business by selling jewelry from home. At-home jewelry party companies are plentiful. The startup costs run the gamut from almost free to hundreds of dollars. As always, your chosen business opportunity shouldn’t be based on price alone but should instead be based on your love of the product. It’s a hard sell when you are not naturally enthusiastic. Known for being skin-friendly, their nickel and lead-free products are loved by all customers. You will have a great time enjoying lower prices for gorgeous jewelry items and selling them to friends and family that share your great taste. You can gain a 25% – 50% discount on products as a stylist of the company and can get a commission of up to 35% on all your sales. Stylists can earn an average income of $160 – $400 for giving 3-5 hours per week. Stella & Dot have a strong community system that makes the stylists part of a big family. Known for its affordable prices and stylish designs, this company also offers you a chance to become a part of the group. With low initial costs, you can easily earn money from working for flexible hours. You can sell the items both, directly and online. For online sales, you will be given an opportunity to maintain and operate your website. As a consultant, you can get free jewelry and can get a 25% commission. By working with Paparazzi Accessories, you will be able to get a 45% commission for your hard work and commitment. Moreover, you can make up your work schedule and do not have to feel bound by any outside pressure. There is unlimited earning potential by working with this company. You just have to choose a sponsor and select a starter's kit to become a consultant for the company. Instead of hosting parties, you will be hosting bars that will give you an opportunity to earn free jewelry and enjoy numerous offers. Origami Owl is best known for the gorgeous customizable jewelry collection and is sure to be loved by all of your guests. 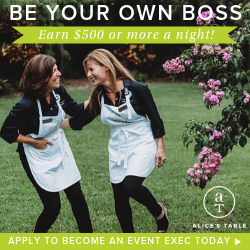 As a hostess, you will be earning a 30% of all sales that are higher than $1000, a 25% commission for all sales that are more than $750 and less than $999, and a 15% of all sales that are more than $250 and less than $499. Apart from these commissions, hostesses can also get discounts on certain items. Park Lane Jewelry offers its hostesses a chance to enjoy many benefits. From buying any four items at a 50% discount price to receiving a $200 credit whenever any of your three guests register themselves as hosts within a month of your party, all of these offers are loved by every hostess. For every order, you can enjoy a $20 credit, and if your orders come out to be 10 or more, you can get your credit doubled. The kind of party you host depends on your time and availability of space. There are no restrictions placed by the company, and you can work in whatever way you like. This company only just recently launched. Their magnetic jewelry pieces are interchangeable to easily match your style and attitude. They are also designed with your health and body in mind, incorporating bio-energetic elements believed to protect us from the many EMFs, electromagnetic frequencies, we come in contact with each day. Sara Blaine designs all the striking items that you can find in this company’s collection. Depending on your requirements, you can become a stylist in two ways. You can either be a virtual stylist or a fashion stylist. Both of these options will help you earn a commission of 25-35% of the sales that you make. You will also get a chance to have your website through which you can reach out to different customers. Becoming a hostess for this company is a fairly easy process but brings along many benefits. As a hostess, you can receive plenty of free products and can enjoy a 50% discount on other items. For sales that amount up to $1000 or more, you will receive a 25% commission. For $600-$999 worth of sales, you can get a 20% commission, for $300-$600, you can get a 15% of commission, and for sales of $150-$299, the hostesses can enjoy a 10% commission. Not only is this company known for gorgeous and delicate jewelry items but is now becoming popular amongst women looking for business opportunities. A commission of 10% – 30% can be earned by arranging a get-together and selling the products. You will not have a problem while selling since all the items are simply irresistible and will surely be admired by all your friends and family members. This particular company does not only help different women earn but also works towards creating a better future for many unfortunate women all around the world. So, by becoming a part of this company and acting as a hostess, you can take baby steps towards building a better life for many people. The rewards might not be as lucrative as others, but the sense of satisfaction is sure to be higher. As you can see, there is a jewelry party company for every budget and style. The above companies offer great training and marketing materials to help you get your new business off the ground. Pick an opportunity that matches your personality and has a price point your target market can afford. Vist the websites for all these companies today and find out how you can earn an impressive amount by sharing your passion and enthusiasm for gorgeous jewelry items from home.